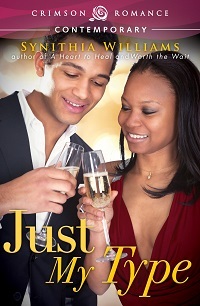 Today I introduce you to a new title from Synithia Williams: Just My Type. Please be sure to read on for the excerpt and review, and don’t forget to enter the tour-wide giveaway where you could win a a Print Book Bundle including: YOU CAN’T PLAN LOVE, WORTH THE WAIT and A HEART TO HEAL Please be sure to check the other tour stops for different excerpts and reviews, and a guest post. 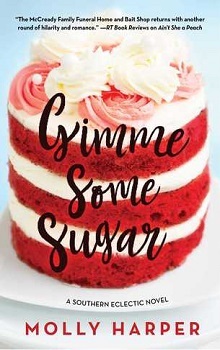 My first encounter with this author, and I have to say that it was a nice change to find a romance that featured African American characters that weren’t characterized by an urban theme or setting, and not overwhelmed with ‘street appropriate’ language. While there are several urban authors that I adore, I also want to see stories from the other perspectives, those stories from people who aren’t headline news but should be. A good romance feels real and solid, with characters that you can relate to, and their differences from you (financial, religious, and cultural) are solidly presented but it is the similarities that draw you in. We all want love, acceptance and happiness, and we all have obstacles to overcome as we seek that perfect person. Romance should celebrate finding love and the differences in relationships, no matter the race or color of the characters. Synithia Williams manages to provide an entrée into a developing relationship between two characters that speaks to every romance reader, and that presents us all with a new way of seeing the people around us. Janiyah is a bit spoiled and headstrong, wanting to have it all but not necessarily dedicated to working for it. She enjoys her free time, and with her father willing to supplement her expenses, she isn’t ‘required’ to finish growing up and take responsibility for her life. Fun loving and flirty, she is the outgoing girl who is the center of attention and often speaks or acts before she thinks things through. Fredrick (or Freddy as Janiyah calls him) is a few years older, and as the best friend of Janiyah’s brother Aaron, he knows the little spitfire well. He finds her interesting and attractive, but far too much like his mother in behavior and desires than he wants. Fredrick wants a woman who will be happy with him and want to work together for a successful life, and he doesn’t think that Janiyah is capable of hard work or controlling her desire for luxuries. Watching his father “lose his mind” over his mother, and keep the family in debt as he bought ever-more luxurious items to keep his mother happy, he won’t be caught in that trap. These two have a long history, and there has always been an attraction on Janiyah’s part. But, Fredrick remembers the spoilt and tantruming little girl, sees the young woman all too happy for Daddy’s help with her bills, and well, it IS his best friend’s little sister. Every moment of attraction that Fredrick has is quickly cooled by one or another of those images, and his reminder that he will not behave as his father did. Early on, it is clear that a strong attraction exists, but the relationship is a series of baby steps. Janiyah has to reveal her true self, and Fredrick needs to make peace with his misconceptions and start to see her, and himself in a new light. Several interactions and moments where the ‘real’ heart of them both come to light, and the reveals and pacing are perfectly suited. You really KNOW these characters and start to cheer them on – waiting for them to take that last leap of faith and go for it. Williams uses the secondary characters and the expository moments in a perfectly constructed story. While the secondary characters serve only to fuel the insight we are gaining on the new couple, they don’t overreach their purpose, and help to flush out the story. They don’t interfere with the main story arc that is Janiyah and Fredrick’s budding relationship, and the arc shows a solid progression from tentative to steamy, without much fluff or filler that would only distract. A story that many romance lovers need to read – this is a book that is carefully crafted to give maximum smiles to readers. “I can’t believe you wore that tonight,” Fredrick said. Not a damn thing. No man in his right mind would be able to concentrate on anything but seeing her out of that dress. Which was exactly why she shouldn’t have worn it to a professional event. She sighed all girlie like and leaned heavily into the couch. He’d seen that look before. She’d set her sights on that college professor. He felt slightly sorry for the guy. Janiyah made it easy for men to fall in love with her. She loved new things and a new boyfriend was like a new toy. Fun, shiny, and exciting, until the newness wore off. As soon as the poor schmuck fell in love she lost interest, usually leaving the guy scratching his head and wondering what he did to lose her so quickly. He knew from experience, though he’d never really had her. The summer before she was to go to college she’d kissed him, and tempted him far more than he cared to admit to take it further. Common sense kicked in and he’d pushed her away. But it didn’t stop him from wondering about maybe, after she’d experienced college and grew up a bit, asking her on a date. That plan was quickly shot to hell when a few weeks later he and her brother Aaron found her wrapped up in the arms of some wannabe thug. “His name is Gerald Westlock,” she said, oblivious to his trip down memory lane. He’d noticed she never would call his ex-girlfriend by her name. Janiyah hadn’t liked her, said he needed someone less stiff. He’d brushed it off, until he’d caught Desiree alphabetizing his canned goods. But he wasn’t going to give Janiyah the satisfaction of knowing her observation had led him to break things off.